Another Tuesday, another patch. I had somehow gotten it into my head that this one would be the one with the new flashpoint, but actually that one is slated for 5.4 it seems, so my disappointment with its absence was entirely of my own making. For now, the theme of handing out goodies to different parts of the player base that have felt neglected for a while continues. 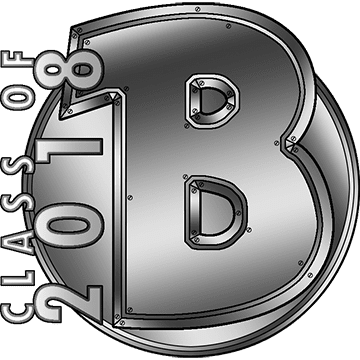 First off, there were some class balance changes. I have some guildies that keep asking me for opinions on these things and all I can respond with are blank stares. As someone who plays healers for life I pay remarkably little attention to numbers, so as long as I can do my job in ops and don't get focused too hard in PvP, I'm happy. I'm not even too worried about the Commando survival nerfs that people keep crying about (though nothing has been implemented yet), because I don't actually take most of those "OP utilities" as a healer anyway. As long as they don't take away the wonder that is Echoing Deterrence (the survival cooldown with the built-in reflect), which has increased my survivability in warzones tenfold compared to how things were before its introduction, I'm good. 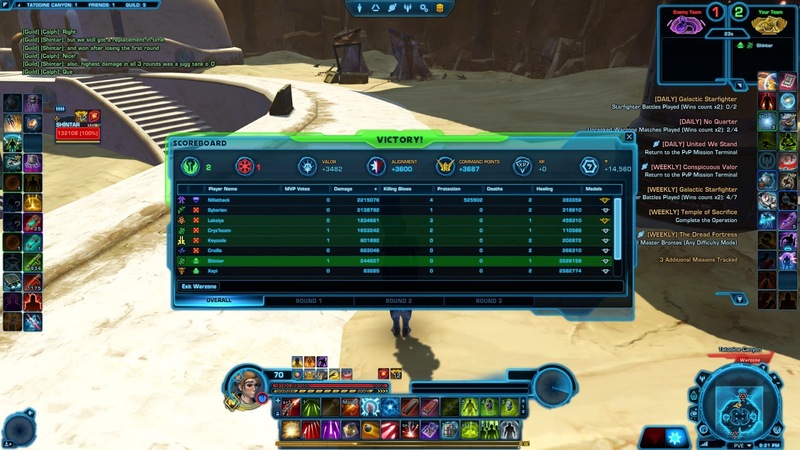 I jumped into a warzone and ended up in an arena where the person who did the most damage by far was a Juggernaut tank. I didn't think that was a thing Bioware was balancing for? 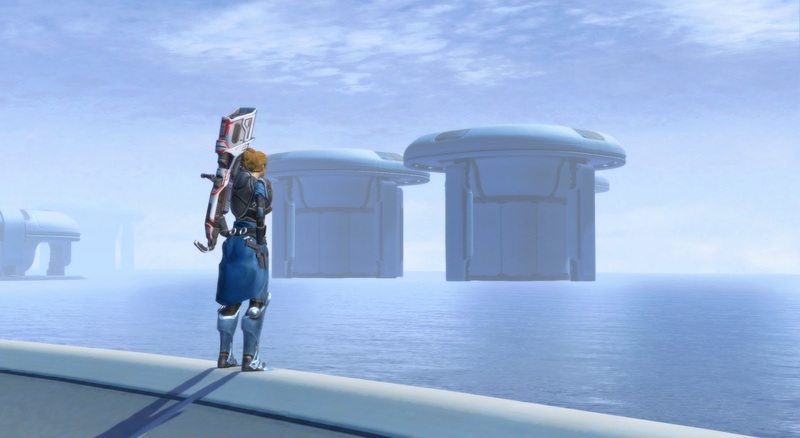 There is also a new stronghold on Manaan. I bought it because I had the complimentary Cartel Coins to spare but I haven't placed a single decoration in it so far. I was quite curious about Galactic Strongholds when it first launched but never really turned into a true housing aficionado. But honestly, it looks pretty even while empty, and the lighting in the outside area looks good for taking screenshots. ... which is something I did with Lana and Koth, who've now also been given the honour of becoming customisable. I was initially surprised that I couldn't see any change, but basically they come with a "customisation" by default which retains their current look, but you can take it off and they'll suddenly lose a lot of muscle and acquire a slightly sickly complexion to allow you to dress them however you want. I can't get over Koth's forehead without those goggles there! I think I'll just leave them both as they are. Though I have been doubting myself a bit, based on the amount of chatter I've picked up from people who are over the moon about being able to put them in different clothes. I'm somewhat reminded of how I felt when Galactic Starfighter launched and I didn't really care about it, but since it was all everyone was talking about I felt that I should give it a try because I didn't want to miss out. Is playing space barbie really where it's at? I don't know. My guild also had a brief look at the new operations encounter on story mode, but I really want to see more of it before giving my opinion on that! I think I've finally worked out why I really don't like the idea of customising the Fallen Empire Companions but will happily dedicate some effort to constructing outfits for the rest of the standard crew. Since our original Companions grew with us they also needed to have their gear constantly updated. Most Players therefore developed some form of idea about the 'best' looks for certain Companions because of this, most prominently Troopers whose Companions all used the same stats and aesthetics. This also invariably caused people to associate gear-upgrades with a more-defined character as the story progressed. 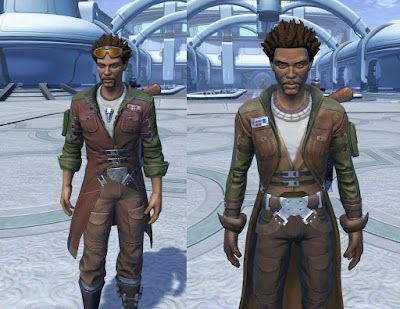 Now we get to Senya, Shae, Koth, Theron, and Lana. All of these characters have pretty much gone through their "growth" period before we even meet them, and as a result they obviously feel more defined as individuals. It therefore makes more sense to me to never need to customise their looks since there hasn't been as much of a 'need' to with theirs as there used to be with all of the originals; they're theoretically more experienced in the 'general' field and should have a better idea about what's combat-worthy or not than us who are either far more specialised or just not that experienced in military-grade hardware at all (see: Smuggler and Sage). There's probably something else to it that I'm not seeing, but this is what my mind is finding as the currently-most-logical solution. I put Lana in her SoR outfit toute de suite, but other than looking at Koth and going "yup, I could do this thing," I haven't bothered. Theron I don't care enough about, one way or another; his teenage fashion follies suit him well enough. And Shae Vizla is already wearing Armor By Mandalore, which is why I'd put her in anyway. 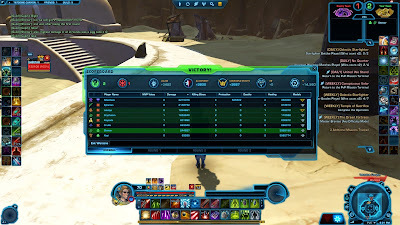 Unless I was using her prior to KotFE, I guess, because I'd put her in anonymous armor rather than her custom gear. About playing Space Barbie, I can tell you that apparently that's the appeal of some MMOs. About how this outfit looks on a toon, and how that outfit looks. And where can I get THAT outfit at? And so on, and so forth. I'd never seen anything like it in an MMO. It may be more prevalent in some games than in others, but it does amaze me in general how obsessed MMO players have become with dressing up. I mean, there have always been people who cared about their character's looks a lot, and we have more cosmetic tools now than ten years ago, but it still amazes me. I do think there has been a priority shift in the mindset of the average player. I have AN ENTIRE ALBUM on Facebook dedicated to my SWTOR outfits, it's up to something like 100 pics (not all are unique outfits, of course). And I don't have THAT MANY characters! (My wife has something like 11 or 12 outfit slots unlocked account-wide, it's just about all she does with her sub CC grant). I've seen blogs that talk about outfits --Njessi's is one, and Kamalia's WoW oriented blog is another-- but I'd never seen people gushing in-game with other people about outfits in a public area. And I did a double take, and I wasn't on an RP server just to be certain. I'll have to keep an eye open on this when evaluating TERA, but it might be that costuming is a large part of the appeal to that game. And here I thought it was just the (lack of) clothing and the jiggle physics. I am totally on board with your companion customization remark: I think they look really good as they are already, so I have no desire to change them. The normalized postures look so much more boring and generic, too, And this is coming from someone who loves to dress up their characters every now and then and documents them with "Fashion Fridays". Hmm, I thought I'd chime in on this one. Guess I do a bit of Space Barbie dress ups lol. Usually for any given toon, I'll have 3 to 4 outfits set up based upon the planet or terrain etc. 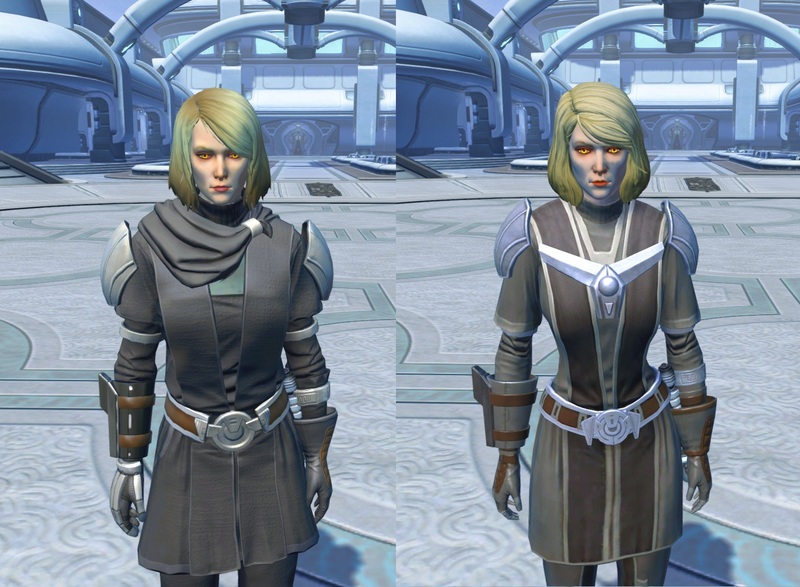 As to the Companions, I was never happy with Lana's post Revan outfit, personal preference is all. I do tend to customize outfits for followers and will drop some credits if I find a set I want to run them in. This is mostly for immersion and just to have something that feels personal. I think when people look at outfit customization it is because a sense of individuality not utility. Now, some followers just plain look like they belong in the outfit they have, Koth being my main example. I would never change what he has on because it just looks cool to me. I have of late taken a lot more care in this area since my net connection just isn't up to par for OPS or serious pvp play. I guess this also follows on how I take a lot of care in decorating my primary SH. Again, falls back into immersion for the game for me.